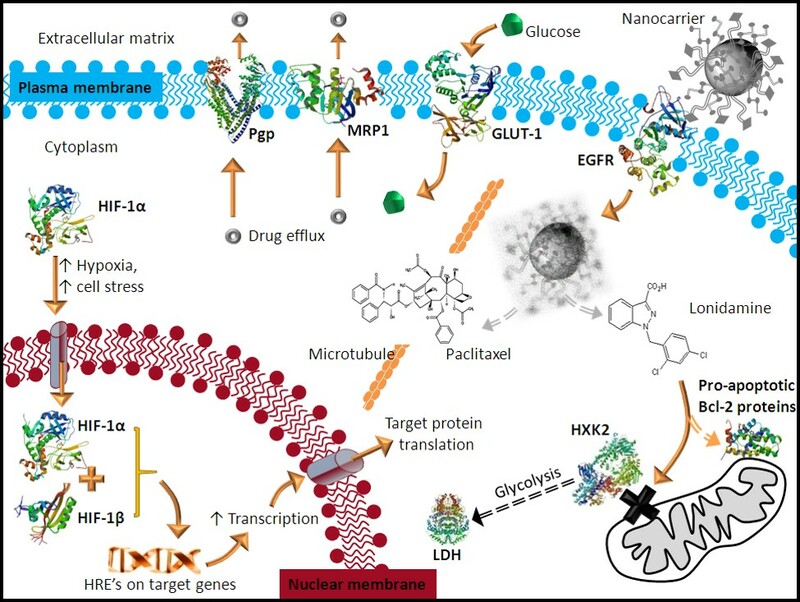 These EGFR targeted nanoparticles exploit the overexpression of growth factor receptors in hypoxic, multidrug resistant cancer and inhibit the Warburg Effect by delivering Lonidamine (a hexokinase 2 inhibitor). Lonidamine lowers the apoptotic threshold for paclitaxel and the drug combination reverses multidrug resistance in triple negative breast cancer. 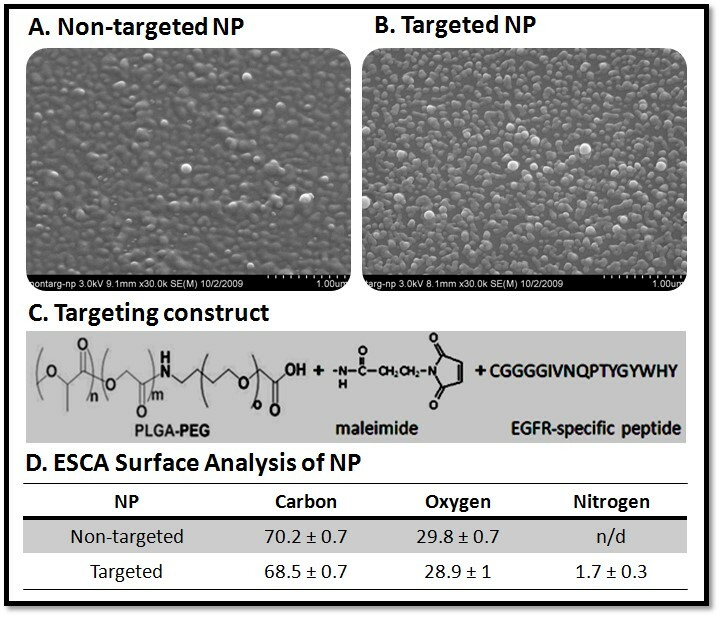 SEM and ESCA of Non-targeted and EGFR-targeted Polymeric Nanoparticles. 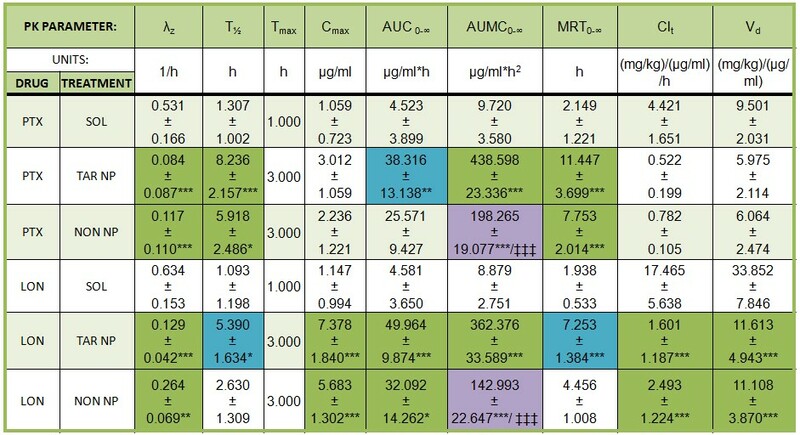 The design of the targeting construct is also shown in Panel C. ESCA analysis confirms targeting residue on surface of nanoparticles. 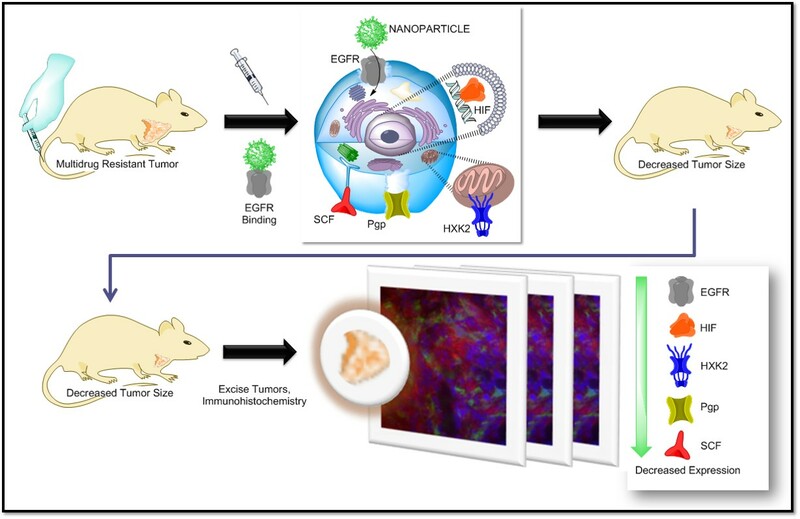 EGFR-targeted nanoparticles accumulate at the site of the tumor and have a similar biodistribution to non-targeted nanoparticles, yet have improved pharmacokinetics. 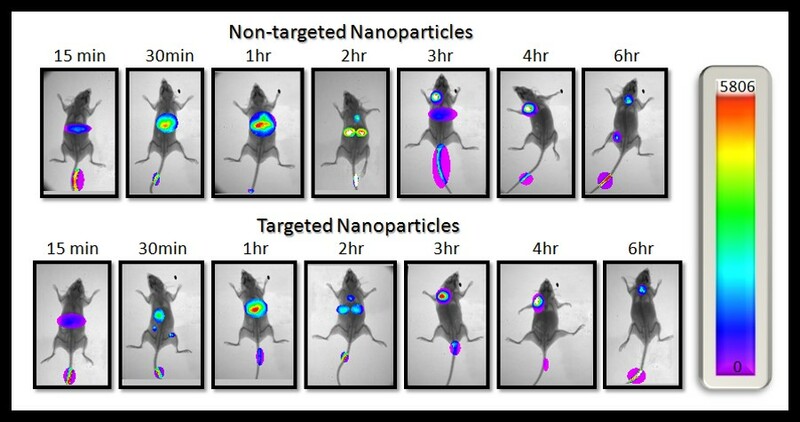 Targeted Nanoparticles Reduce Tumor Size and Reverse Drug Resistance. Combination therapy (lonidamine and paclitaxel) with EGFR-targeted nanoparticles reduce tumor size and reduce the expression of EGFR, HIF, HXK2, P-gp, and SCF. Treatment with EGFR-Targeted Nanoparticles Improves Plasma Pharmacokinetics. Treatment with EGFR-Targeted Nanoparticles Improves Tumor Pharmacokinetics. Dr. Milane aims to explore cancer biology and develop molecularly targeted nanomedicines that exploit the hallmarks of cancer. The therapeutic design is to actively target a receptor that is overexpressed in cancer while combining two drugs that modulate different hallmarks of cancer and demonstrate drug synergism (improved combination index). Dr. Milane also aims to develop molecularly paired first- and second-line nanomedicine therapies for cancer. Drug resistance is the standard for cancer and as such, new therapies need to be designed as a series of successive treatments based on empirical data for effective drug sequencing. Dr. Milane has a new patent application in the field of targeted nanomedicine treatment for cancer. 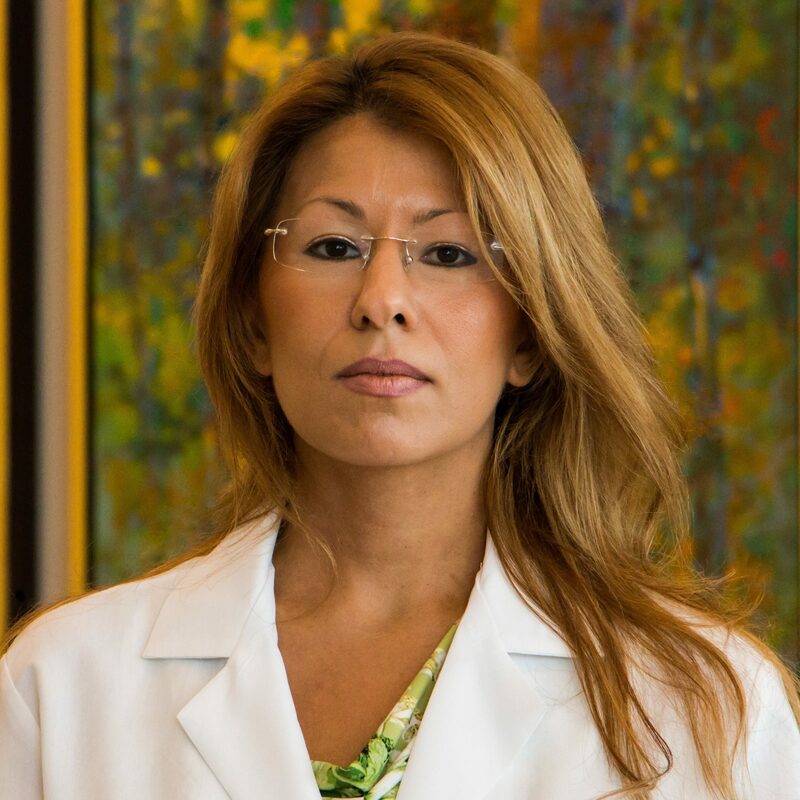 Dr. Milane has coined cancer as "survival of the fittest at its finest". Dr. Milane understands cancer in the context of molecular evolution. A cancer cell is a cell that adapts to selection pressures with the sole mission of cellular survival. Dr. Milane drew this image to illustrate cancer exosomal biology. 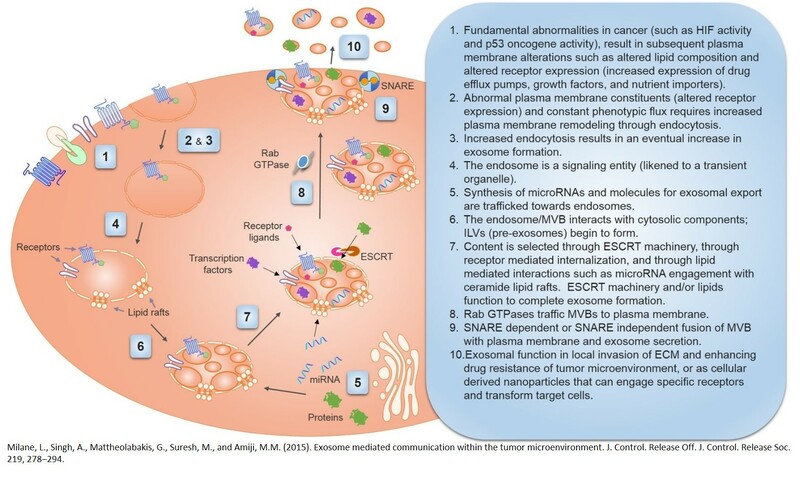 Cancer exosomes aid survival as they function in metastasis, autocrine growth signaling, avoiding immune clearance, and macrophage polarization. Cancer is very much a mitochondrial disease as cancer cells are cells that are resistant to apoptosis, which is mediated by mitochondria. 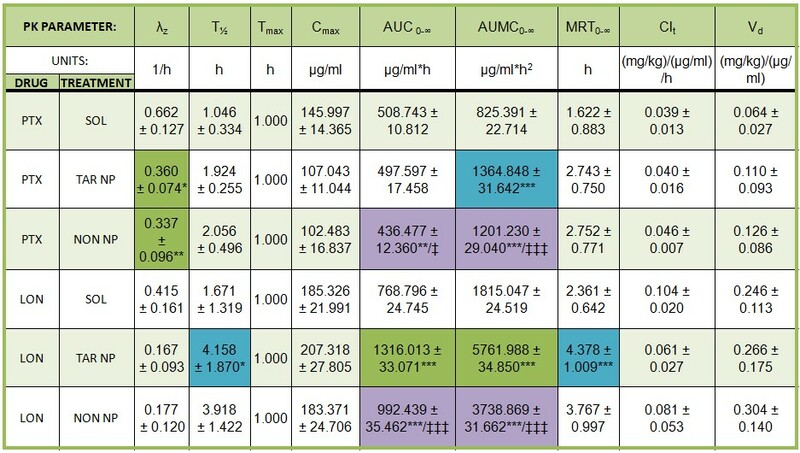 Cancer cells also revert to aerobic glycolysis (the Warburg Effect) for energy (less reliance on oxygen and mitochondrial oxidative phosphorylation and less toxic free radical production). 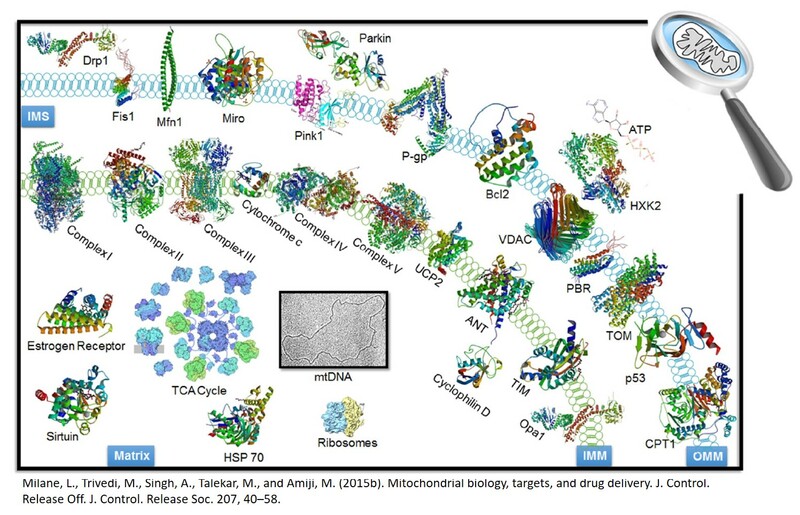 Dr. Milane has identified the druggable targets in mitochondria and is interested developing mitochondriotropic drug delivery systems.